Jefferson Middle School (JMS) has a problem. Every weekday, in the morning and the afternoon, a dangerous traffic situation is created as parent pick up and drop off their children. This problem is not unique to JMS; this situation occurs at almost every grade school in the country every day. It is unique in that JMS is located in a neighborhood that was designed pre-automobile dominance. It was built in an era when most students walked to school. It has great pedestrian connections to the neighborhood, featuring 3 passageways that connect directly to the school grounds. Unfortunately, it appears that most students no longer walk to Jefferson anymore. 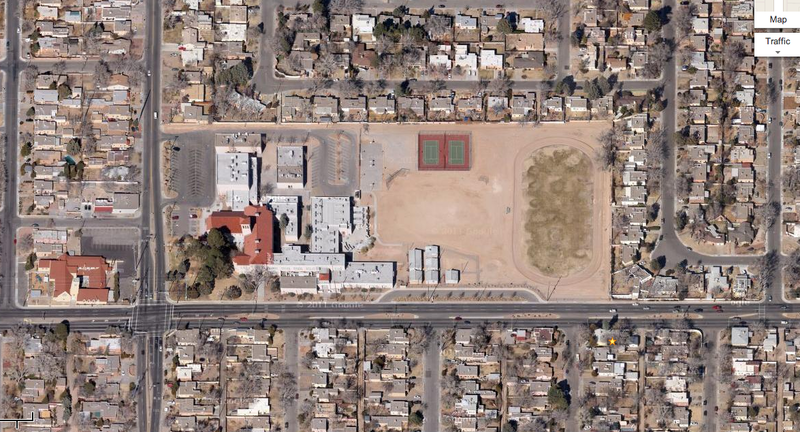 The three neighborhoods surrounding this property, North Campus, Summit Park and Nob Hill, recently discovered that APS is actually planning on breaking ground on the road at the end of May 2013. APS says they are fast tracking the project because the current traffic situation is a huge danger to students. The neighborhoods, and especially the neighbors who have backyards adjacent to the property, are not happy. Many meetings have been held in the past two weeks about this project and an article about the project appeared in the Albuquerque Journal on Wednesday, May 22. Framing the Issue: What Can $572,000 Buy? The debates about this project have been both fascinating and disturbing. Few neighbors or parents want this project to happen. However, no one is proposing an alternative. This is possibly because the parents who do not want this project are also the parents who are driving their children a 1/2 mile to the school everyday, feeding the problem. Within the most recent APS bond, $572,000 was specifically allocated for this project. A total of $1,456,865 has been allocated from the APS bond to pay for the entire project, which includes construction of a grass field, a track and drainage improvements. Since this money is specifically set aside for this project, it’s unlikely it can be used for other infrastructure improvements. But just for fun, what could we do with $1,000,000 in bicycle/pedestrian improvements? Let’s take this a step further. 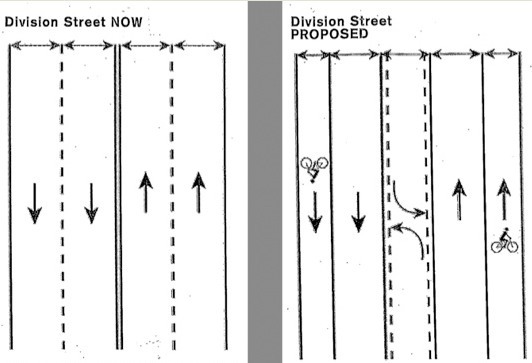 From the same NCDOT document (pg. E-3), a project is described: “East Blvd. Pedscape, including repaving for a road diet from 4 motor vehicle lanes to 2 motor vehicle lanes, 2 bicycle lanes, a turn lane, improved ADA curb cuts and crosswalks with safety islands. Final Cost = $1,050,000 ($398 per linear foot)” (NCDOT). Guess what else is a ½ mile? Girard between Central Avenue and Frontier Ave.
All of the fixes proposed in this post are not new; they are described in detail in both the Girard Boulevard Complete Streets Master Plan (specifically pg. 29) and the North Campus and Summit Park Neighborhood Transportation Management Plan. Both of these plans were created with a huge amount of public involvement, specifically involving the very neighbors who are protesting this project! They seem to have forgotten about these documents since neither of them have been mentioned. The high speeds on the current configuration discourage walking. With one lane in each direction, the speeds would drop dramatically. The other problem with this plan is induced demand. It’s quite simple: more roads/lanes = more people driving. However, induced demand works both ways: more bike lanes/routes/trails = more people cycling. At this point in the process, APS is ready to break ground. The plans are ready and APS is reluctant to change them. Since the bond money is allocated to specific projects, it’s unlikely that the money could be used for bicycle or pedestrian improvements. At this point, only the City of Albuquerque (CABQ) can prevent this project. 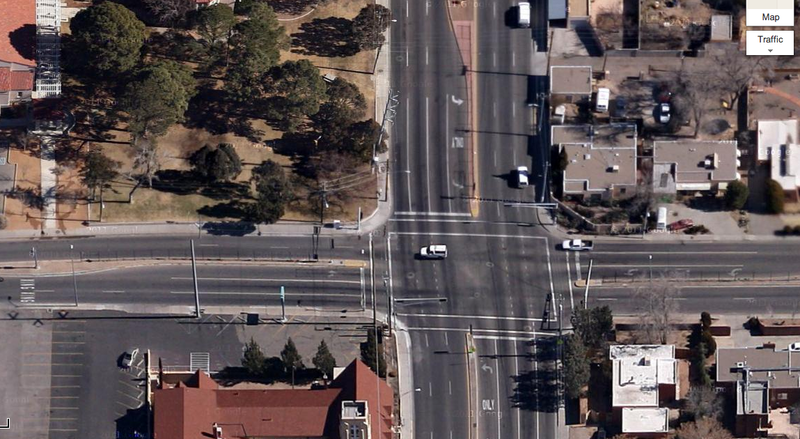 APS needs CABQ to provide a permit to create a 24 ft. curb cut on Lomas for the road. APS has not yet applied for the permits so there is hypothetically time. If enough citizens call their city councilor and tell CABQ to withhold the permit, it may happen. The other thing the city could do is use emergency or discretionary funds to fast-track the proposed improvements to Girard. Combined with an education program at JMS for the coming school year + a comprehensive bike/ped encouragement program (EX: the Walking School Bus), there might not be a traffic problem after all. A Walking School Bus (groups of students walking together + a chaperone) would allay the constant parental fear of sexual predators. If enough students and parents decide to walk or bike to school, the need for this road would completely disappear. A great federal program called Safe Routes to School has been doing amazing work in communities across America. Click here for more information on this topic. If you care about this issue, now is the time to take action. Contact your city councilors by clicking this link. A website has also been created by members of the neighborhood in protest of this plan. View it by clicking here. Thank you for reading! Please comment below if you have anything to add to the conversation. Note: This was originally posted on the Urban @ ABQ website on 5/19/13. I am posting this here so I can have a copy on my site. The original post also had a different picture. Find the original post here. Thanks for reading and please comment! Picture this: it’s a beautiful spring Saturday morning in Albuquerque, New Mexico. The Paseo del Bosque multi-use trail is filled with families and other users. A few blocks away, Downtown Albuquerque is empty. Most of the businesses are closed; the few open ones are struggling. What if the trail users, many of whom are on bikes, could be drawn into Downtown? What if we could combine pedal power and people power into a boost for small local businesses? The Bicycle Friendly Business District (BFBD) initiative aims to accomplish this. Connecting bicycle users to small businesses is a great way to incubate the local economy, encourage people to use their bicycle and activate previously underutilized places. According to Green Octopus Consulting, a pioneer of this initiative, “a BFBD is a commercial district where the merchants encourage people to bike to the area to shop and dine – and where merchants and employees ride, too. BFBDs integrate bikes into a district’s operations, events, and promotions.” (Economides, April). + a handful of other corridors scattered around the city. 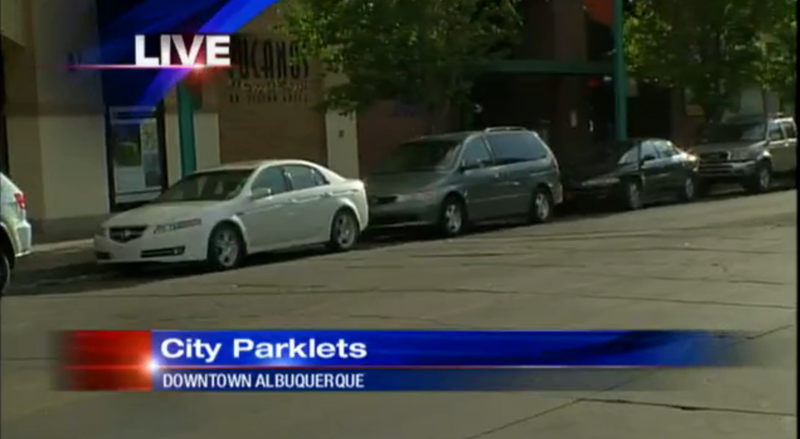 Urban at ABQ is targeting Downtown as the location of the first BFBD in Albuquerque. Is there proof of bicycles being good for business? Yes! 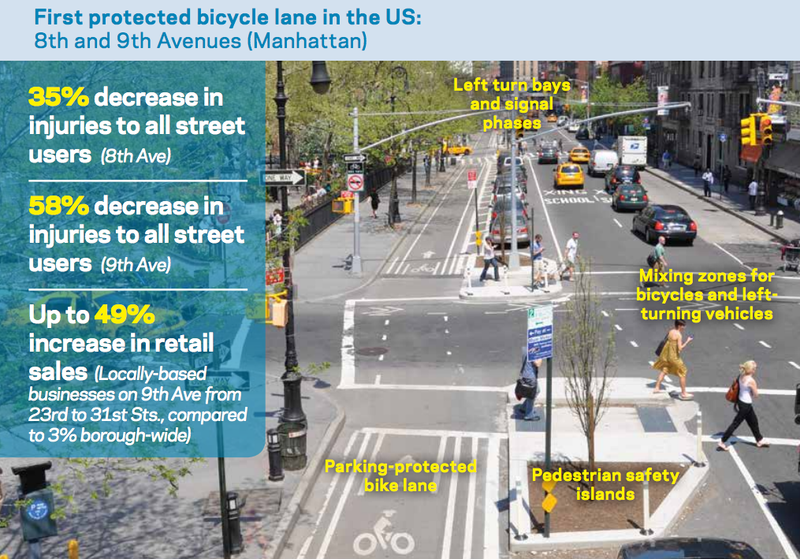 The NYC DOT recently released a report about the impacts of bicycle and pedestrian oriented infrastructure changes. It showed retail sales increasing between 49%-172% in areas where bicycle or pedestrian infrastructure was created or improved (Measuring the Streets: New Metrics for 21st Century Streets). In addition, the impacted corridors became much safer. Injuries and fatalities declined dramatically for all road users, especially automobile drivers. Safer streets are better for businesses too. The typical response to this would be, “New York City has nothing to do with Downtown Albuquerque! There is no way this would work in Albuquerque!” In that case, let’s examine an example that’s closer to home: Long Beach, CA. Long Beach is the pioneer of the BFBDconcept. In areas where the BFBD treatment has been applied, 18 new bike related businesses opened over the course of one year (Green Octopus Consulting). Long Beach Mayor Bob Foster understands the value of bikes: “‘I see parts of the city on my bike that I would never even notice if I was just driving,’ he said. ‘It’s a way for me personally to get closer to the city’” (Streetsblog, 3/13/12; Snyder, Tanya). Bicycle tourism is also on the ride. People come from all over the world to bicycle tourism hubs to spend time and money. In Colorado, our neighbor to the north, bicycle tourism is a $1 billion/year industry (Economides, April). One of the major complaints about visiting Downtown is the difficulty of parking. It’s not necessarily an issue of quantity but the ability to find a reasonably priced parking space. Bike corrals, a key part of the BFBD formula, can help to alleviate this issue. A bike corral replaces a single curbside parking space with a bike rack. The visibility of a large bike parking rack on the street edge communicates to cyclists that the local businesses value their support. Encouraging more people to cycle frees up parking spaces for the people who really need them (EX: the elderly). Urban at ABQ is currently working on an initiative that would permit this type of infrastructure. According to current city law, it is illegal to build a bike coral. 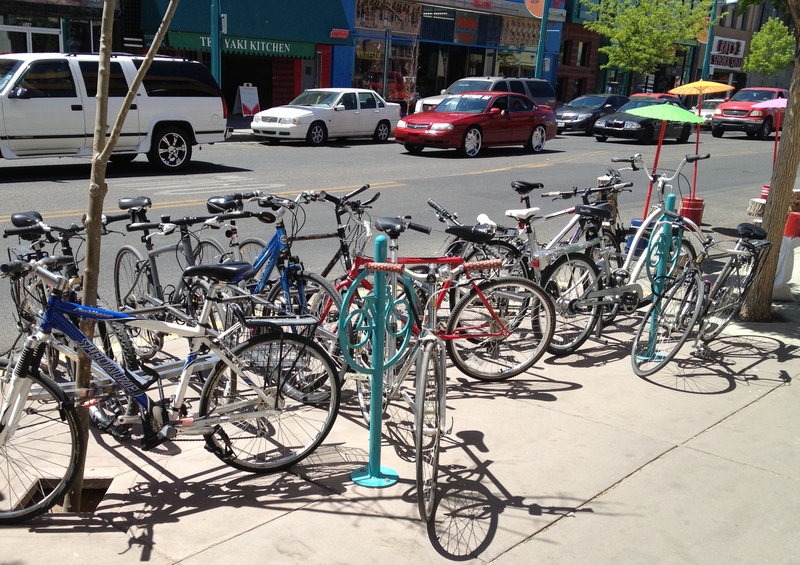 Albuquerque is on the cusp of being the ultimate bicycle friendly city. For decades, we were on the cutting edge of bicycle infrastructure, building miles of trails along the river and along our arroyos. However, much of this infrastructure is oriented around recreation vs. commuting. Across America, cities are quickly realizing that encouraging bicycling for transportation can be the best solution to reducing traffic congestion, obesity and transportation costs for citizens. It can also stimulate local economies. Albuquerque is already far ahead of many mid-sized American cities in this regard. All of our buses have racks for 2-3 bicycles on the front. A huge percentage of our roads have bicycle lanes and bicycle route signage. We had one of the first bicycle boulevards in the country; the portion of it closest to the university is typically filled with a wide variety of cyclists on a vast array of bicycles. Old Town Farm, which is close to the Paseo del Bosque trail, sees hundreds of cyclists on the weekends at the Bike-In Coffee truck on the property (visit oldtownfarm.com for more information). Marble Brewery, a Downtown bar, typically has far more bicycles parked outside than cars. Every weekend in the spring and summer, the various paths and trails around the city are packed with families cycling and walking. The time has come to connect the dots, build upon our existing assets and move Albuquerque to the next level. 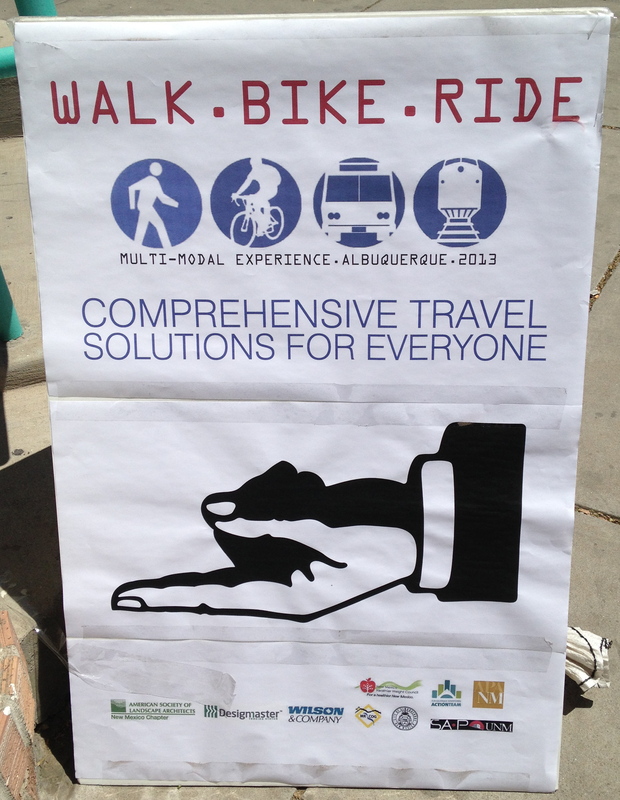 This past month, members of Urban at ABQ have been walking around Downtown collecting data. We are assessing the existing infrastructure in order to guide the development process. Our assessment is taking stock of existing bike racks, bus stops, bike shops and other supportive elements of a BFBD (bicycle friendly businesses such as restaurants, coffee shops, etc. as well as potential areas for new bike racks and more). Once we have processed all of this data, we will prepare a report identifying the improvements that must be made in order to create a Bicycle Friendly Downtown. This will include recommendations for both the public and the private sector. For example, we might recommend bicycle racks for certain areas (public sector) and targeted bicycle oriented promotions (private sector). We will present these to the Downtown Action Team and the City of Albuquerque. Albuquerque continues to struggle from economic woes. The states surrounding us have recovered from the recession while New Mexico continues to stagnate. In order to compete, we must use our existing assets to build a new economy. In urban areas across the nation, a tangible transformation is occurring. After decades of divestment, downtown America is once again the “place to be”. As the Great Recession stopped sprawl in its tracks, city cores continued to grow. “College-educated professionals between the ages of 25 and 34” are driving this growth. (Forbes; Brennan, Morgan; 3/25/13). The future of real estate and value creation in cities is oriented around enhancing existing build environments. High-density infill is the most efficient use of our limited resources. Orienting these new developments around bicycles, mass transit and walking for transportation is key to their success. It’s time for Albuquerque to become Albikequerque. Last Friday, one of the local news stations featured a segment about speeders in vehicles destroying the quality of life in the neighborhood. The story focused on the stretch of Carmel Ave. pictured above and highlighted by the red rectangle. A few portions of the segment drew my attention. 1) Emergency Access Creating Emergencies: The neighborhood has requested speed bumps but apparently they can not put in speed bumps because Carmel Ave. is an emergency access route. The irony here: this provision creates conditions which will inevitably necessitate more 911 calls. 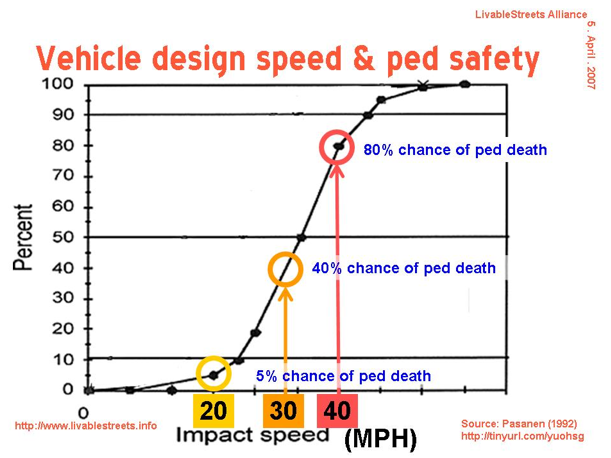 When someone is hit at 40 miles per hour, their chance of survival stands at 5%. If they are hit at 20 miles per hour, their chance of survival is 85% (source). How fast do you think people are driving down this street? Installing speed bumps would increase emergency response time by a few seconds. 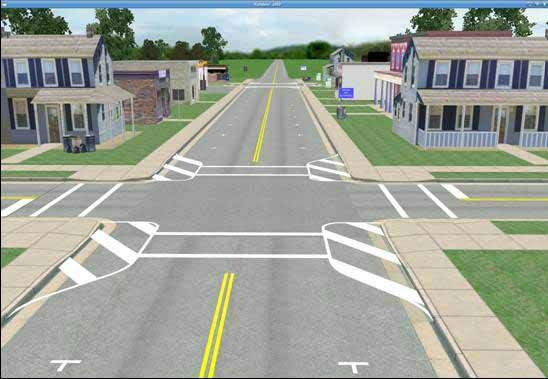 Installing speed bumps or some other traffic calming would also increase quality of life and walkability, reduce speeds and create a better neighborhood. It would appear that our priorities as a city are a bit off. 2) Neighborhood Streets as Highways: Looking at this street, both from the news segment video and from Google Maps, it’s too wide for its intended use. There is enough space on this street for on-street parking and two way traffic. On street parking is a great way to slow down driving speeds in neighborhoods. However, there aren’t any houses fronting this streets. This means that there are rarely vehicles parked on this street. Therefore, the street feels to drivers like a desolate rural highway and the drivers treat it as such. It seems that the neighborhood is in a pickle. What can they do? The short term answer: paint. 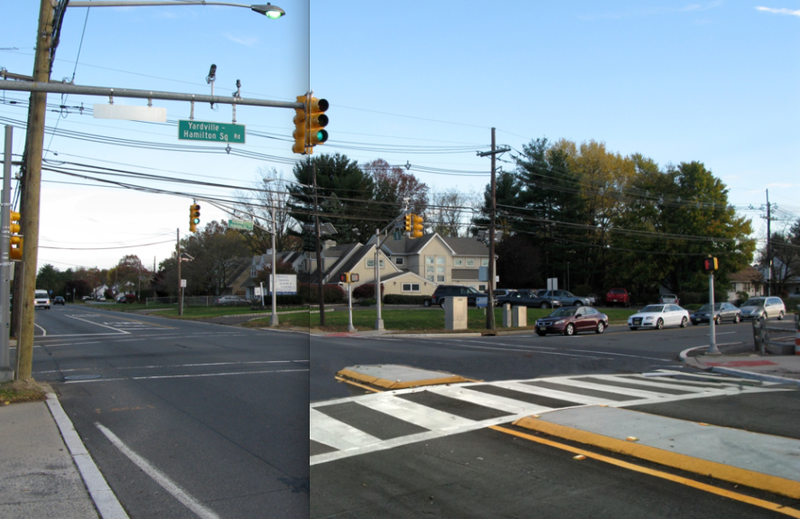 Though it’s not as good as building actual curb extension, painting bulb-outs, displayed in the image below, can help to visually narrow the street, reducing speeds. It also won’t impede emergency vehicle access. Eventually, the neighborhood should campaign for physical infrastructure improvements. Until then, paint could really help. 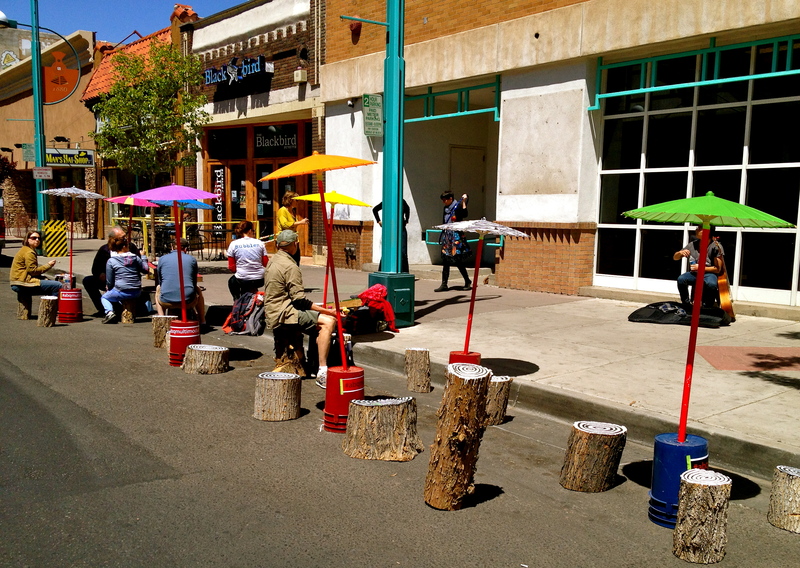 Channel Four News aired a segment last night about parklets. Tim Trujillo gracefully covered the subject in the video segment, explaining the social and economic benefits of having safe and pleasant places to hang out and spend time Downtown. Here’s a link to the full article and video. In cities where parklets have already been built (such as NYC and San Francisco) local businesses were not initially supportive. Once businesses realized people spent more money in places where they could safely sit, demand for parklets and plazas increased. For example, in Times Square NYC, a large portion of Broadway Blvd. was converted into a plaza in 2009. Since that change occurred, retail sales and rent values have skyrocketed (Streetsblog NYC). All over America and the world, residents and planners are realizing that people are the key to successful places and spaces; cars are secondary. Soon, Albuquerque will join a group of great American cities that prioritizes space effectively and reallocates space from cars to people without much more than a signed piece of paper. Until that moment, we must all join together and tell our city what we want. Albuquerque is NOT for cars; it is for us, people, Burqueños. We want to walk and bike and use all of the streets safely. Our city leaders understand this but they need to hear the message more forcefully. Other cities across the country are beginning to realize that endless low density sprawl is a recipe for economic disaster. A strong core is key to the success of a metro area and parklets are a step in the right direction. On April 19, I experienced the Multi-Modal Experience event Downtown. It included lectures, a walking tour and a biking tour. The event took place in an office building on Old Route 66 in a room with walls covered in interesting and innovative solutions to our current mess of automobile dominant development. It is known as the UNM City Lab. Julie Luna of MRCOG delivered an impressive lecture summarizing a road safety analysis done by MRCOG and staff on a segment of Central Avenue just west of the river. The analysis led to some unexpected findings such as the real and perceived dangers of jaywalking. It included interesting and useful information about user behavior on that stretch of road, specifically bicycle users (many wrong-way riders) and people on foot. Members of CABQ mayors staff made presentations about ABQ The Plan, ABQ Ride, Route 66 and the proposed 50 Miles Loop. Sections of the future loop were explored on the biking tour in the afternoon. City staff members emphasized the importance of using public investment to leverage private investment. Erin Marshall had a great presentation about the connection between the built environment and obesity. She covered Safe Routes to School, MAP-21 transportation policy updates, Complete Streets and more. One of the neat elements included as a part of this conference were actual temporary urban improvements. A large mobile bike corral, filled with bikes, occupied the front of the building. During lunch, a parklet/parquito replaced a couple parking spaces. A food truck (the always tasty Boiler Monkey) and a busker completed the vital urban space. After a self-guided walking tour around Downtown, everyone met at a parking lot on 6th & Central. Routes Rentals and Tours brought funky cruiser bicycles for attendees to use. 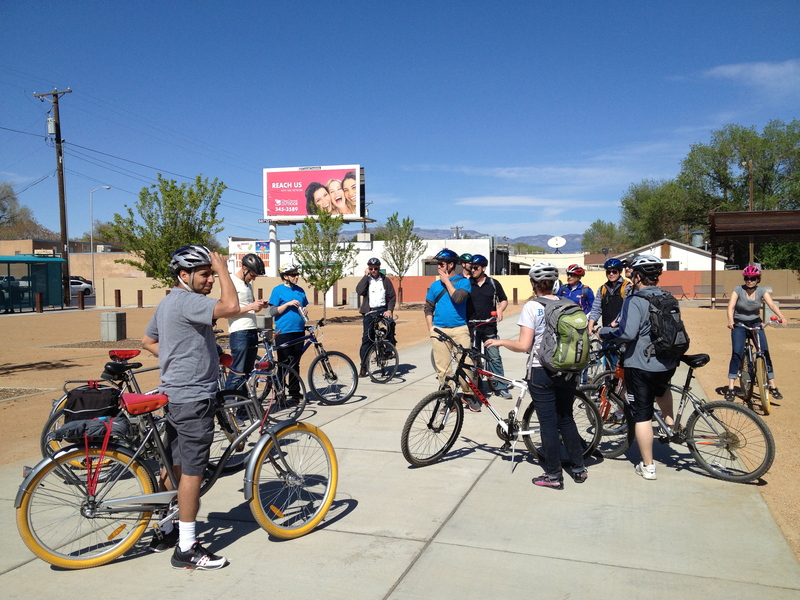 The tour led us through a variety of different areas, from Old Town to the South Valley. Along the way, we discovered the great, the bad and the awful bicycle infrastructure which exists in Albuquerque. Different people talked at different stops along the way. It was helpful to really get out and see the infrastructure we were talking about in the conference. The walking tour and bicycle tour helped to emphasize what is currently working well in the urban landscape and what is not. This event was a mix of inspiring and discouraging. The presentations by the City of Albuquerque staff emphasized the reservations I have about ABQ The Plan. When bicycle infrastructure is discussed, the emphasis is always recreation and never bicycles as transportation. When BRT is brought up, flexibility is emphasized more heavily than consistency, reliability and permanence. In other cities across the country, bicycling is being used for business incubation. That conversation needs to be going on. Once can generally find the same set of professionals found at these types of conferences. Where are the local residents? Where are the transit users? The gap between academia and reality is unfortunate and difficult to overcome. However, we at least left the room at this conference. We actually went out and engaged with local urban environment. This is key to change occurring. Overall, it was an informative and useful conference. I expect and hope more urban engagement at the next one. Did you attend this conference? Do you think ABQ The Plan is on a good path? Comment below with ideas and questions.